For many years, Peter and I have managed our shared Many Tricks files via Dropbox. To support Dropbox, we purchased an upgraded plan for $99 a year, which came with 1TB of space. We then used the same login to share the Dropbox folder. We didn’t need anywhere near 1TB (we have about 4GB of shared files), but felt it was right to support Dropbox. While this worked well, and we had no issue paying for it, we had a few concerns—about space, third-party involvement, and something possibly unique to my usage scenario. You can read the details in the remainder of this post, but to make a long story short, I went looking for a replacement. And I found one in Nextcloud. Nextcloud has a commercial product, but it’s open source, so you can also install it on your own server, and via many hosting companies that have it preinstalled. 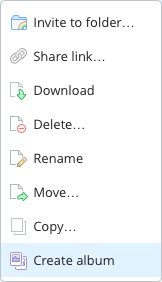 For us, Nextcloud has every feature we need for sharing our Many Tricks’ files; read on for more detail on why we moved, install and admin, the Mac client, and some closing comments. Note: Dropbox—sadly—removed this feature in July of 2017, so don’t even bother reading any further. Copy or move a folder of images into your Dropbox folder. Choose any location within the Dropbox folder that you wish; I set up a Photos folder to hold slideshows. Open the Dropbox web site, and sign in to your account. Navigate to the folder you just uploaded, right click, and choose Create album. Click Share album, then copy the link or directly invite those you’d like to see the album. That’s it, your’e done. The only time-consuming portion of the process is uploading the images; creating and sharing the album takes almost no time at all. That’s about as simple as it gets. Now assume you want to do the same thing using iPhoto: create a web-based slideshow of images for anyone to see via a shared URL. Sure, you could use iCloud’s Photo Stream, but that’s not a web-based solution. Instead, you’ll need to use File > Export in iPhoto, and either create a Web Page or a Slideshow. Slideshow is really misnamed, though, as what it really creates is a movie of your images. So Web Page it is. Do Dropbox droppers do due diligence? Apparently Dropping Drobpox is a thing now, because Condoleeza Rice has been named to the board of directors. I’m aware of at least two prominent people (Chris Breen and Mark Frauenfelder) who have publicly discussed their Dropbox departures, and I assume there are many more. First, I admire these folks’ convictions and follow-through on those convictions. For me, Dropbox is too ingrained in what I do to make such a switch. Additionally, I don’t believe someone sitting on the Board of Directors of a company is reason enough to change my practices relative to that company’s products. However, for those who feel strongly about Ms. Rice, I assume they’d want to avoid any companies that have directors with similar backgrounds, right? In order to make such decisions, they need to do due diligence on any company whose products they might like to use. To ease that task, I put together a brief list, based strictly on companies having board members involved in the military-industrial complex, and who may have been active in the same timeframe as Condoleeza Rice. I use a lot of cloud services for file storage, primarily Dropbox, but also Box and (begrudgingly, for certain shared projects) Google Drive. I also use iCloud, but not in any way that would be considered a true cloud file storage service. I use it strictly as a sync service for contacts, calendars, reminders, notes, Safari; I also use Back to My Mac. But that’s it; I don’t use iCloud for cloud-based file management at all. Why not? Because iCloud in its current implementation is chock full of the stupid, at least for those of us who still use and rely on OS X. Note that you can get additional free space on Dropbox through referrals and uploading images; Box occasionally offers a promo with 50GB of free space. Kirk McElhearn covers this price and space issue in more detail in his blog post, Why Does Apple Only Offer 5 GB Storage with iCloud?. I agree with him; if iCloud wants to attract more users, it needs more free space, and more competitively priced upgrade plans.